Ossett Brewery (this establishment has received the OBE Ossett Brewery excellance award)Black Sheep as house ales with two other guests changing every other week. All cask ales £2.70 per pint. Special offers on other products Monday to Thursday include Stella 4, Sumersby Cider £2.00 per pint, Carlsberg £2.10 and Worthington Cream Flow £1.90, Guinness £3.10. Every First and Third Tuesday is our Chill Out Solo Acoustics Open Mic night with Mike,all musicians and singers welcome. Fridays Live Music, Saturdays Live Music, Sunday Afternoon Live Music every month, so check with us for details of artists and dates. If you are into sports then why not visit to see your football, racing, rugby etc on Sky Sports, BT Sports and Racing UK. Two plasma TV,s and a large projection screen. Monday nights is dart and domino night. 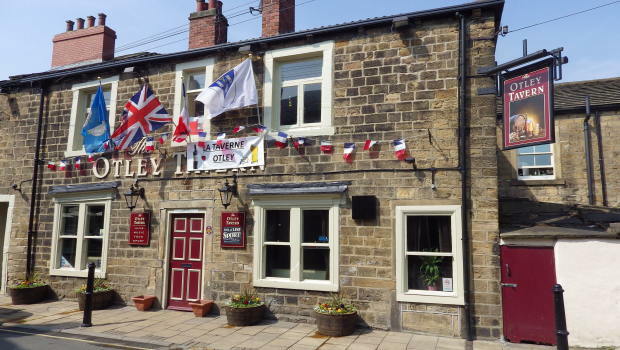 The Otley Tavern also has its own football team who play at wharfemeadow football field on sunday mornings, if you are a keen footballer and want to be spectator then contact us for our fixture list. The Otley Tavern formaly The Ring O’ Bells was originally built as three cottages, some of the property possibly dating back to the mid 1700’s. Each cottage had a door and window on the ground floor with a bedroom window above, and subsequent alterations have taken place in respect to the lower windows. Before becoming a public house, it was a better-class lodging house for itinerants. Formerly called the “Travellers Rest” and then the “Welcome Inn,” the story goes that it became the “Ring O’ Bells when John Russell took over the tenancy in 1895. It appears that on one occasion when Mr. Russell was on the top of Chevin, he heard, and was intrigued by the melodious notes of Otley Parish Church chimes which floated up from the valley. On his return home he decided to re-name the inn the Ring O’ Bells, the name it has retained ever since. He was a sporting personality, and for many years was ‘Umpire’ for the Otley Rugby Football Club. As part of his sporting activities, Jack Russell liked to back the ‘gee’gees’, and on one occasion won £100 – a tidy sum in those days. “Now he said, “I will either be a man or a mouse”. Alas, in a fortnight he was the latter, and the bookies got their money back. He died in 1898. The Ring O’ Bells was sold by Punch Taverns (October 2012) and bought by Leeds Based Cornertrack Limited, an independent company trading in Free houses. Otley Pub Club Chairman Peter Jackson was appointed as licensee 26th March 2013 with support from his wife and Membership Secretary Fiona Jackson. The Ring O`Bells closed on 7th May 2013 for a complete refurbishment and re-named as The Otley Tavern.